This entry was posted in International Law, War Crimes by Hawaiian Kingdom. Bookmark the permalink. I was arrested twice and beaten by Big Island police for being identified as Kanaka Aupuni thru drivers license and ID. The second arrest was a double jeopardy arrest called for thru an “open” warrant without charges named. I was jailed both times and one arrest was federal in nature. The beating exacerbated prior injuries; I did not file charges or a suit because the legal system is u.s. in prejudice. Barbara Takase would not hear the double jeopardy case advising the prosecutor “not to touch him” (as best I can remember), she retired as a judge soon after. Hilo police officers would not and/or could not cite charges on the double jeopardy request and still took me in restraints to jail. I needed to present bail for all arrests. On the first arrest my personal property of Hawaiian License Plates were taken off of my vehicle even while the police were advised that it was against their laws to take personal property. The plates were returned after representatives of both the Lawful Hawaiian Government and the State/County government met and discussed the situation. We were advised that we would continue to be stopped and arrested and cited in the future. No Hawaii traffic laws were being violated. Although these events took place 5 or so years ago I continue to be under medical care for pain to my body. The county and state have gained financially by these attacks on the kanaka Maoli and Aupuni and thru other avenues also make our ability to live with and within our culture nearly impossible. This personality is criminal and they, the u.s. must recompensate the Free Sovereign Hawaiian Aupuni for this hewa. Uoki ka hewa !! Requested an open hearing with the Lawful Hawaiian Government also and was adjudicated as not guilty complying within LHG law on the first arrest. My name is Whaitaima Te Whare from Aotearoa NZ. 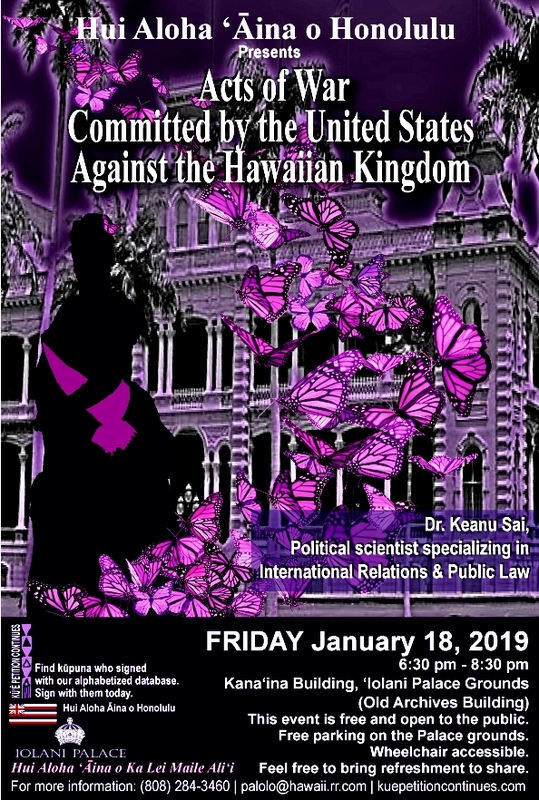 My interest in the works of Keanu Sai a Ph.D Political Science specializing in Hawaiian Constitutionalism and International Relations. I would like to purchase the book called Ua Mau Ke Ea. Since following the Hawaiian kingdom blog I am very much interested in learning more. I am trying to wean myself off computers and devices and would like to purchase the book. My efforts to find the book here in Aotearoa through google sites are non existent I did find 2 copies on amazon incl freight fees the costs are NZ$180.00 for a 2nd hand copy. Is it possible to buy a copy at a cheaper price from ex students or if I could be put in touch with someone who may be willing to share/sell their copy is much appreciated.